Topaz Electric Non-insulated throat 90-degree BX-flex connector of trade size 4-inches, is suitable for use with flexible metal conduit, aluminum and steel AC and MC cables. 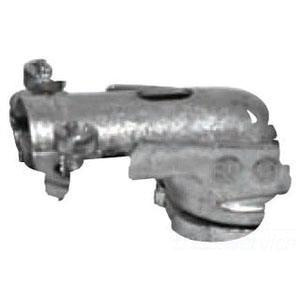 Connector features die-cast zinc construction. This 10.2-Inch long connector with squeeze connection, has thread length of 1.031-inches. It accepts conductor of size 3.68 - 4.43-Inch. Connector has zinc-plated steel strap. Connector is UL/cULus listed and CSA certified.